The 2013 Goals I am documenting this year will only be personal finance ones. I know its towards the end of January, but I wish you well this year. I am planning to set achievable goals this year. My 2012 goals were not very realistic, but I didn't do that bad either, I think. BUDGETING: Live on at most 60% of my income and invest at least 40% of income. 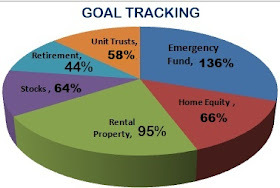 EMERGENCY FUND: 2012 ended on 130% of target (12 months) emergency fund. I am reducing that to 3 months worth of living expenses in the money market account. I will use the rest to acquire more stocks. GIVING: Maintain giving of more than 10% of income. REAL ESTATE: Construct at least 4 flats in the small town property I am buying. Increase the rental income by 30% after the new flats are constructed. REAL ESTATE: Pay up our home. Its the only debt we have. STOCKS AND DIVIDENDS: Get at least R12,000 in dividends. Average earnings of R1000 per month. in dividends. Double the stocks we have. EXTRA INCOME: Take online income to R8000 per month by December 2013. 2013 is the year I may actually hold a job again. I will give it a try. On one hand I am excited by that and on the other hand frightened. I enjoyed taking care of my family. Whatever I choose to do will have some positive impact. Going to work will fast track my investments whilst being at home may grow my online income and keep my calmness. I need the calmness a lot more. But I may stick to a permanent retirement in my early 40s. We'll see.